Now that I've kind of got VANISH under my belt and know what I'm doing with that I thought it was time to start writing the BLOG again. It's a good way to introduce the latest magic tricks that come on the market and share my thoughts on them. I will remind people that I really only talk about tricks that I like and enjoy. The same is for VANISH - I only review the ones I like. 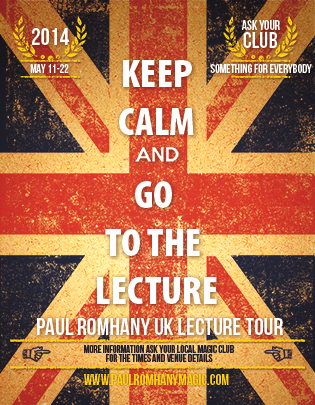 I'm looking forward to bringing my lecture to the UK - would love to see anybody if you are in the area. Imagine being able to read spectator’s fortunes without having any prior knowledge of cold reading, palm reading or Tarot. This deck does this and MORE! You are supplied with 30 different fortune cards in Tarot size, which fit perfectly in to your pocket for walk-about. The spectator can choose any card and read their fortune. You can leave it there or continue with any number of routines supplied. These special cards are made from the highest quality and the design is breathtaking. Built in to the design of the cards are also secret marks that allow you to do a wide variety of material. Anthony himself sometimes just takes this ONE deck with him when hired to perform for the elite in Europe and the UK. READINGS ON THE FRONT – each of the 30 cards have different positive readings on the front. Each reading is carefully worded so there are no negative connotations. Some will make them think and leave them with questions but there is nothing ‘bad’. NUMEROLOGY – on the back of the cards between the fingers are numbers. This enables you to give quick and effective numerology readings. MAGIC SQUARE – this is the world’s easiest Magic Square. If you add up every number on every card you will find they all add up to 42. This makes a great giveaway on the back of your business card. MARKED DECK – The cards are marked in a subtle way so you can either use this as a stacked deck system, or if somebody chooses a card you know what the reading is without looking at it. Also provided is a crib sheet to help. You can also do this as a Tossed Out Deck for stand-up or stage performances. ONE-WAY DECK – Because of the unique hand drawing if all the fingers point in the same direction. TOSSED-OUT DECK – a stand up routine where people select cards and you can actually tell them which ones they have chosen. Fortunes Hands is Anthony’s first public release from the vast array of material he has honed and collected over many years and will be welcomed by both mentalists and magicians who want to add something unique to their working repertoire. Having tried this out the past two months at walk-about gigs I can tell you this is one of the strongest pieces I’ve added to my professional repertoire in a very long time. You can do as many card tricks and flash shuffles as you like, but there is nothing the paying audience want more than to have their fortune told. This specially designed deck does exactly that and much more. Not only does it allow people to have their fortunes told, it also has lots of extra additions that enable you to perform some true miracles. Each card is marked in a very unique way that allows you to also give a very basic numerology reading then do a magic square on a person using their selected numbers. What is so clever about this deck is you don’t have to actually know how to work out a magic square, it’s the easiest version I’ve ever seen. For walk-about this makes the ideal effect because you can work this on several people doing different readings and effects. You don’t need any prior knowledge of cold-reading to use this and actually it isn't even cold-reading. It allows you to connect with your audience and they become emotionally involved. I’ve never had so many people ask for business cards before – perhaps that is the real strength of this. The deck is designed so it allows you to do several different routines as well as give various readings. You can have predictions on your business cards, or just read a person’s mind or just tell them their fortune. If you’ve never given a ‘reading’ before then you should invest in this and find out how strong this can be. 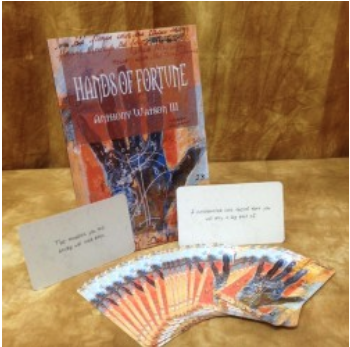 If you are a seasoned pro then I know you’re going to love what this deck of 30 fortune cards can do. Whether you are a magician or a mentalist, if you do any type of walk-about entertainment I highly recommend this deck by Anthony Watson. The instructions are well written and the deck will open up a lot of possibilities for routines and making connections with your audience. The cards are Tarot card size and printed on high quality Tarot card stock. I carry mine in a little pouch and it fits perfectly inside my inside jacket pocket. A good friend of mine just bought this and he also told me the reactions are some of the best he's getting. He isn't a cold-reader or mentalist and just does mostly walk-around magic. I told him to try it out and he said people were loving having their fortunes told and then having the addition of the effects really made it strong. Five of the most influential books in the field of mentalism since 13 Steps. Quite a bold statement but once you've read the material you'll know exactly what I'm talking about. These books have come in to print and sold out almost instantly. Only a certain amount were released and so once they go chances are that's it. Within the pages of all these books are a lifetime of effects and articles that Scryer has made a career from, as well as his friends who include the Whose Who of mentalism. The material ranges from powerful mentalism style routines to techniques on giving various readings to everything else under the sun when it comes to the field of mentalism. All five books offer such a vast array of material it's almost impossible to choose a favourite or even describe them all. I will say that I have been a huge fan since the very first Black and White books by Scryer which went out of print very quickly and thankfully was introduced back as a double book. These books are GOLD and the information in them can help make careers for people. Many contain not just 'effects' but entire presentations and routines that you can create an entire evenings entertainment from. I am fortunate to own all of the books and these are the books I refer to more than any other in my huge library. I am constantly reading and re-reading them getting ideas that I can develop and work on. The material is valuable for magicians, mentalists as well as people who like to do cold-readings. Magicians will find it valuable for the effects as well as learning more about making a connection with their audience. Scryer's routines with Svengali decks are the best I've ever seen and I've fooled not only lay people with them but many magicians as well. To find out more about the books visit www.hocus-pocus.com and read the material in each book - my advice to every performer is if you are looking at getting books filled with wonderful gems, insights and effects that you WILL use these books are for you. Do check with the contents as some are geared more to 'readers' (cold-readers, etc such as Band of Readers) than others. I had a fun week at a corporate job the other night. I was hired for an Oscars Award themed night for Executives of the banking industry here in New Zealand. The venue was amazing as it was held at the Civic Theatre in Auckland. It's an old theater that was recently refurbished and looks amazing. Here are a few photos from the show. The BIG news this past week was also our son Jon-Paul's FIRST birthday! What a great time we all had. My wife and I actually thought the celebration was more for us as we survived the year as first time parents. The day was filled with dear friends and family and we all had the most amazing time. You have to ask yourself where on earth did the year go? Everybody tells us children grow up so quickly, and now I realise what they mean. It's been the most incredible year and we love every moment. The next issue of VANISH MAGIC MAGAZINE is on the home stretch - and again I am astounded by the high caliber of contributors. Some really BIG names are now joining the team of writers. Our feature artist this month is none other than television superstar Keith Barry. I saw Keith work live recently and got a standing ovation. What an AMAZING performer!! This weeks BLOG is a little late due to a busy schedule. I've been busy working on several projects, had a major corporate gig and doing some work on next issue of VANISH magazine. I spent several hours interviewing a major star for the next issue. I must say it was such a pleasure to talk to somebody, who has worked incredibly hard and is living the dream. He is also very down to earth and grounded, which is always a treat when somebody is such a TV celebrity. This person is equally a star during a live show as he is on television. Keep tuned to find out who it is at the end of the month. Here in New Zealand this past Sunday was Fathers Day and it was extra special for me because it was my very first. I had a great day with my wife Natalie and our young son Jon-Paul who will be turning one this month. Where has the time gone? Wedding magic seems to be very popular in the UK - I'm not sure about other countries, certainly not here in New Zealand. However this is a cute trick that would be perfect for a wedding venue or restaurants where there are couples at a table. It comes with the DVD with extra bonus ideas as well as the cards. Everything is professionally produced and will last a long time. Certainly something restaurant workers will want to consider. MagicTricks is proud and excited to introduce to you Sean Goodman, making his debut with a blinder of an effect...a guaranteed worker and perfect for any wedding magician...completely self working, fun trick to perform...please welcome...Genetics! A fabulous effect to show to a couple! You explain that men and women think differently and like different things. To illustrate this, you show some cards which have pictures of various items such as a dog, cat, iron, whip etc. and suggest that some will appeal to men and some to women. The cards are mixed and then offered one at a time to the man and woman alternately. Any cards they don't want are discarded. At the end, to their amazement the man's selections are turned over and they all have BLUE BACKS, and the woman's have PINK BACKS! You receive a set of specially produced quality cards in a plastic wallet together with an instructional DVD. The DVD runs through different handling variations of the basic plot, and also includes anothergreat routine which has a fab kicker finale. PLUS, Sean also shares his brilliant double business card peek technique which can be added to the basic Genetics routine - this is worth the price itself! A truly practical peek that real workers will use immediately. Genetics is a joy to perform. It's fun and full of audience participation. Simple to perform, immediately resets and packs a punch! And it's DIFFERENT!!!!!! The feel good trick of the year! Everybody knows I'm a huge fan of books, and a huge collection like this is one of my favorites. For those who have been in the business as long as I have will know the name Bruce Bernstein, a very well respected creator of many famous effects. This is a must have book for any performer - an amazing collection of over 30 years of creations, many number one sellers during their time. 256 pages in deluxe hardcover; all material newly edited and expanded and illustrated, with an introduction by Jon Stetson. This week I performed my Murder By Magic Show again. The concept was designed by Cris Johnson, and without a doubt the best investment I've ever made regards a 'business' type package. I'm not sure if Cris is still selling these (check out www.hocus-pocus.com), but I do know if you can get a copy either from the team at Hocus-Pocus or Cris himself then it is well worth it. It is a really great concept for corporate shows and certainly something very different. You could perform it exactly as Cris has done, and as it is in the script - or you could easily adapt it. The concept itself if genius and the corporate clients love it. I can't wait for Cris to release another one. I also had fun designing a few new posters this week. Some of them are 'arty' and some are pretty simple - but still it was fun. I'm busy working on a few new concepts for shows and needed some promo material. Thank goodness for Photoshop. I've also teamed up with a well known UK mentalist and together we are going to re-lease a brand new series of effects from his professional career. I've seen all of them re video and each one is extremely strong. We have several we are planing on releasing at this stage and I'm really excited. He is an actor/mentalist in the UK and his work is very original. While his style is comedy the effects will play well for all types of performers. The series we will call the Pro-Mentalism Stand-Up series. One of the main concerns of releasing things on DVD these days is pirating. I get asked so many times if my books are out as PDFs, and again because people pirate things I have not released them as PDFs. The same with DVDs. Too many people making copies. So - we are releasing each effect as a book with performances only on DVD, plus in some cases props if needed. it's the only way to combat those who want to cheat and steal. I actually also feel it make it a little more exclusive if it's a book, as everybody won't own it. What I love about this series is that the material has been in his professional act for many many years and gone through stages of getting it to where it's 100% commercial. Don't forget if you find yourself with a spare weekend in October and feel like a trip to New Zealand, the 31st International magic Convention is taking place in Christchurch. One of the nice things about a NZ convention is that they aren't too big. There are usually between 125-150 people which is a really nice size, where you can meet and hang out with everybody. I don't have anything to do with it myself, other than they have asked me to design the program and tickets for the shows. There is a real variety of performers coming from Spain, USA, Canada and the UK. Many magician from Australia make the trip over so it's always a fun time. I really like this. It's a very different kind of 'walking through' style illusion that I think is much stronger than a lot of other methods out there. This doesn't use the over-used third hand gimmick. It's well built and will really fool your audience. it fits in to my 'pack small and play big' category that I like so much because of the travel that I do. Peter Lougrhan is proud to present a brand new illusion from the creative minds of James Wiggs and Scott Emo called Fenced In! There have been many 'Walkthrough" illusions in the history of magic, but never one as baffling and impossible as this! You won't believe your eyes. Effect: The performer introduces 2 assistants that are each holding a solid staff with a series of bungee cords fastened between them. When pulled apart they make a fence or barrier that would be impossible for the performer to pass through. The performer stands behind this barrier, pulls up a cloth in front of him briefly and then lowers it showing he has melted from one side of the bungee cords to the other, giving new meaning to phrase 'Bungee Jumper'! You have to see it to believe it! This can be done in a living room or on the biggest stage, and uses NO FAKE HANDS, or third hand gimmicks! This method is so clever it fools magicians too! It can be learned in minutes, and while your assistants will know how the secret of this baffling illusion works, if you don't use assistants then you can easily show any two people, at any show, in just a few minutes to help you with the illusion. It packs small, yet plays like a large stage illusion at a fraction of the price. It is built to last you forever and will baffle any audience guaranteed! James Wiggs and Scott Emo's Fenced In Illusion comes complete with everything ready to go out of the package including the Fenced In barrier shafts with bungee cords, professionally made illusion drape with rod, and instructions. Please note, there may be limited stock on this product at any given time, so in some cases please allow up to 7 - 10 business days for us to ship your order in these instances. Dave Powell is known for producing really good looking wooden props, and this Haunted Block really is a great looking prop. It has the feel of an old style block of wood, which really lends itself well to story ideas and presentations around the age of the block and where it came from. I love this type of magic as it's kind of spooky but very visual. There is an anticipation as the block falls over. Add Robert Harbin's classic telekinetic Tippler to your act with the beautiful Antique Haunted Timber! The magician displays a beautiful old block of wood. He tells a story about how years ago, a wealthy developer cut down the world's oldest oak tree. But first, a witch cursed the ground where the tree grew and all of the wood taken from the forest. The townspeople claimed spirits inhabited the wood, causing it to shake, rattle, and move on its own. It was impossible to build anything out of the timber, as it would just crumble to the ground. They were eager to destroy the cursed wood, yet by an incredible twist of fate, this block survived. The story sounds unbelievable, but some legends are easy to prove. The magician balances the block on top of a bottle and calls to the witch. Bam! The block leaps off the bottle and falls loudly onto the table. The magician leans the block against the bottle at a steep angle. Suddenly, the block stands up on its own! Then SLAMS against the table with a loud bang! The spirits have arrived... or perhaps they never left. * No wires, threads, or magnets! * Made of fine oak for years of magic! * Hand-distressed for a realistic aged look! Based on Robert Harbin's original routine and prop, the Antique Haunted Timber is a block of fine oak hardwood, 9 x 1.5 x 1.5 inches. The block is hand-distressed, aged through a series of seven re-working procedures for an authentic-looking "cursed block." I'm pleased to announce that both of these books have now hit all the magic book stores including my favorite www.hocus-pocus.com. The first is Orange, Lemon, Egg and Canary. it's one of the most classic effects in magic, yet there is very little written on it. This book answers a lot of questions and has my own handling plus a good friend James Holguin's version. James's routine is a really great version because he does it all away from tables, and has put together a really lovely piece of theater. This book is Number 9 in the Pro-Series collection that I am writing. I have started work on Number 10, and again it's a twist on a very classic effect in magic. Here is a book that contains over 25 years of my professional career. It is filled with tips, hints, advice and stories from my career to date. It also contains a lot of material from magicians all around the world. It is a HUGE book that will take a while to read, but even professionals are sending emails saying how much they enjoy it. I'm very proud of this book as there really isn't anything like it in magic. It is also now available from www.hocus-pocus.com. Coming up in October is the 31st International New Zealand Magic Convention. It is shaping up to be a great weekend of magic with international guests including Shawn Farquhar from Canada, Ken Scott from USA, Felix from Spain and The Gillam Family from the USA, and the one and only Mark Mason from the UK. The convention will be held in Christchurch New Zealand from the 19th October until 22nd October and promises to be a relaxed, and fun weekend of magic. Sadly at this point my schedule means I"m booked with other events so can't make it myself, but would encourage all others who are free over that period to get down to Christchurch and enjoy themselves. This is proving to be an extremely popular item at Hocus-Pocus and one that is very well made. If you are looking at a floating ball then be sure to check this out! Price $299.95 for a limited time...Price will increase to $350.00 soon. A timeless piece of magic. Every great magic act needs something that either levitates or floats in the air. When it comes to effectiveness the Wonderball rates highly. Inspired by the dancing cane, the simple and unique mechanics employed when performing the Wonderball allows the magician a variety of mind twisting moves and the possibilities are endless for further creativity. The Wonderball is not only fully self-contained (including an instructional DVD) in it's own attractive carrying case, but the case also serves as an effective prop during the routine. Pre-show set up takes only minutes, and hooking up at show time can be done on or off stage in a matter of seconds, with or without an assistant. The Wonderball can be in most theaters and cabarets with the appropriate background and lighting (a black or sparkly/busy background is best). Also included is a 10 inch brass ring to prove there are no wires, trap doors or mirrors as well as an adjustable belt (cummerbund style). The Wonderball has been priced not only for the seasoned professional but also for the aspiring beginner - both young and old alike. Steve Axtell has really outdone himself. This is AN INCREDIBLE idea and something I think all balloon and vents AND magicians will want to add to their show. Pre-order yours today. Expected release date is mid-late September. This is the manual version called "Twist & Talk" Balloon Puppet System! A simple to use moving mouth on a puppet stick ready for you to twist balloon characters on. So easy to do! Give your BALLOONS something to TALK about!